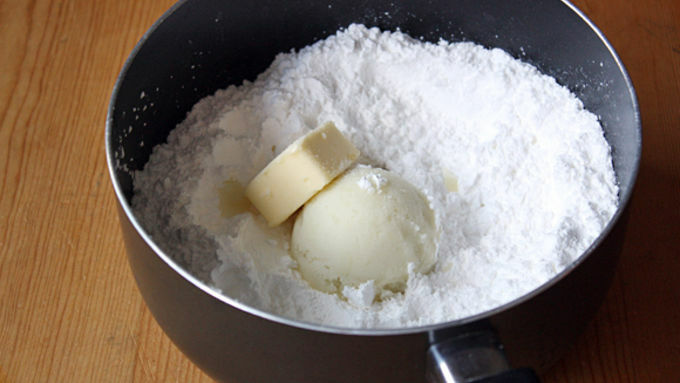 Pour confectioner's sugar in a medium saucepan and make a deep well in the center. Add potatoes, butter, vanilla and salt to the well and place saucepan over a large saucepan filled with water that's just about to simmer. 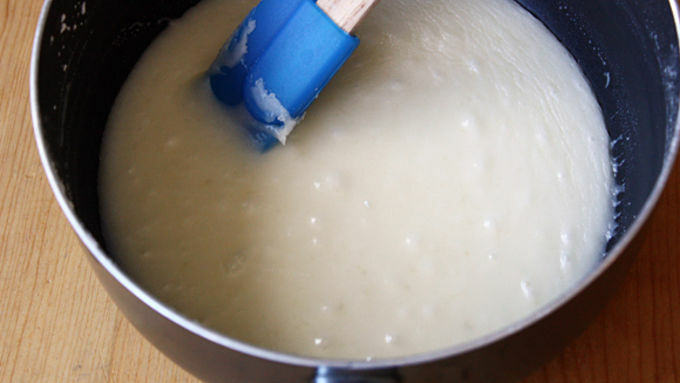 Stir mixture with a spatula, gradually adding confectioner's sugar to the mix, until all ingredients are incorporated and melted together into a smooth paste, takes about 5 minutes. 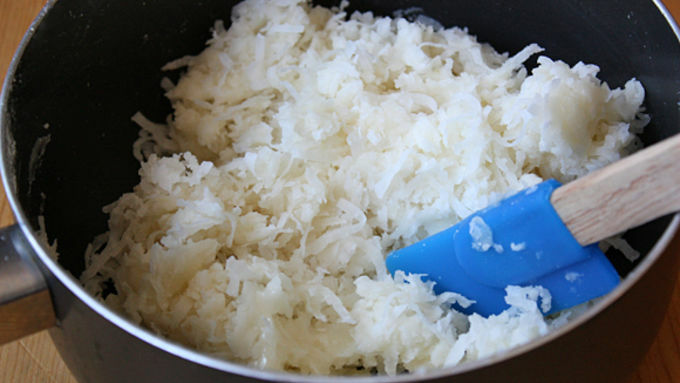 Remove from heat and stir in coconut. Shape dough into a ball, then press into a 4-by-5-inch rectangle on a baking sheet or plate. Place in freezer to firm, 20 minutes. 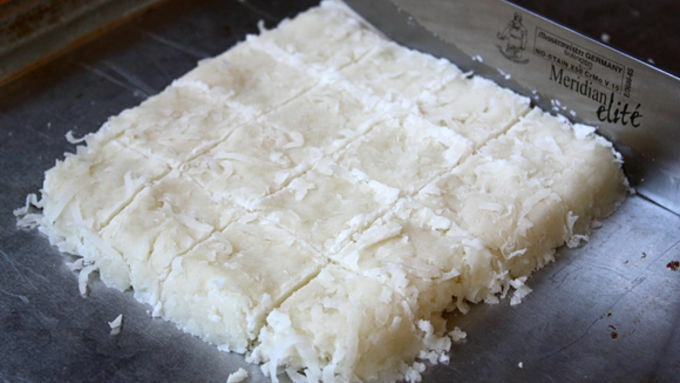 Remove baking sheet from freezer and cut rectangle into 20 one-inch squares. Cover tightly with plastic wrap and return to freezer to firm, for 20 minutes. Meanwhile, make your chocolate coating: In a medium microwaveable bowl, melt chocolate squares into a smooth sauce. Whisk in shortening and stir until completely mixed in, about a minute. Place a silicone mat or sheet of wax paper on a clean baking sheet and set aside. 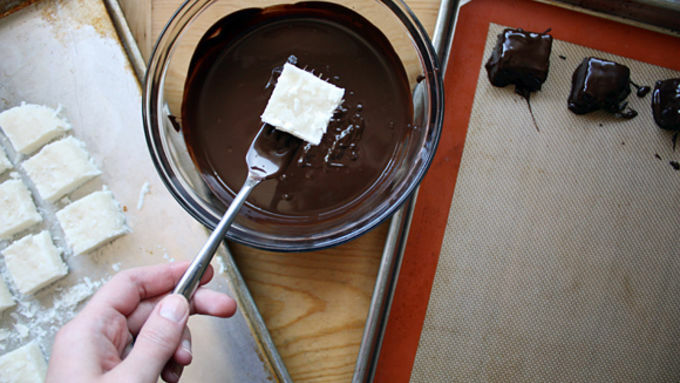 Remove squares from freezer and, using a fork, submerge one square at a time into the chocolate coating. Tap off excess chocolate and place on prepared baking sheet. Repeat until all squares are fully coated in chocolate. Place squares on baking sheet in refrigerator to set, about 1 hour. I have a need. A need for Needhams. Have any of you ever heard of needhams before? Chances are high that if you’re from the east coast where they originated, you have. 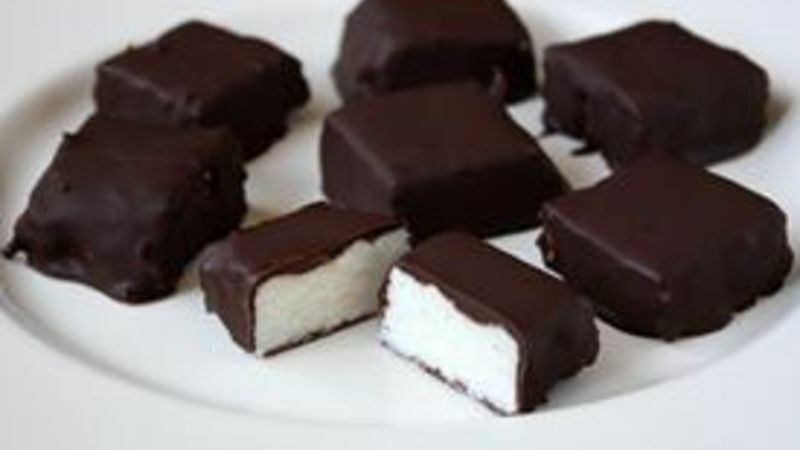 Being a dyed-in-the-wool Midwesterner myself, I’d never had the pleasure of trying (or even knowing about) needhams before until someone told me about this amazing little candy that tastes a lot like a Mounds bar but is made with mashed potatoes. Mashed potatoes! I was intrigued. 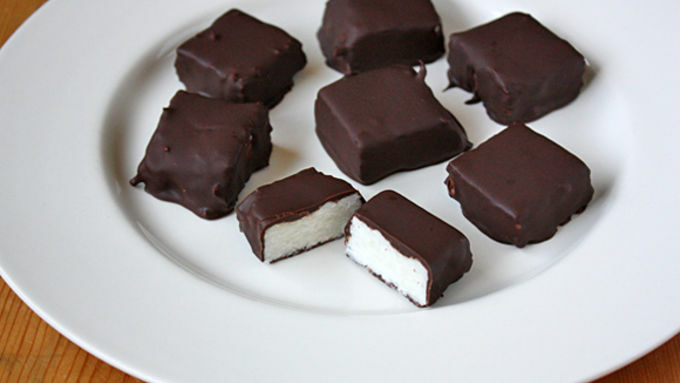 In just a couple hours, I had these delicious, chocolate-coated, potato-and-coconut-filled candies in my own kitchen (and promptly thereafter in my mouth, of course). And I plan on having them on hand for dessert on a certain holiday coming up in a few days… and probably every day henceforth. They’re too good to not have around. Serve and enjoy! And marvel at the wonder that is a mashed potato candy!